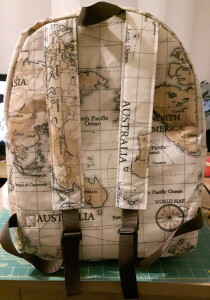 This backpack has been in the works since before Christmas. I made my son a backpack for the beginning of the school year in August, but it was just not waterproof enough, and every time it rained we’d have to dry it and all the contents on the radiator overnight. So we decided we needed a more waterproof version. This one is made from a pvc material, sold in the shop as a table covering for crafts. I used the same pattern as before as I really liked it. 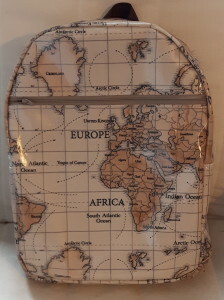 It is the Star Student Backpack from Peekaboo Pattern Shop. I cut the material to get a good portion of the map on both front and back. 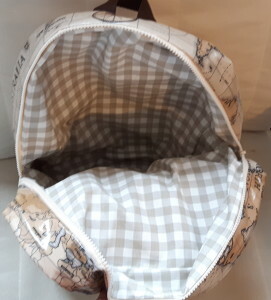 The inside is a beige check, mainly because it was something in the cupboard I had a big enough piece of but it also goes quite nicely with the outside material. The straps are a brown webbing. The main zip was actually a separating zip until I sewed it in – that was because they are nice and chunky and so it’s less likely to break under all the opening and closing. The new bag is a hit and is already in use, although we’re not wishing for lots of rain to test out its waterproofness! This was number 13 on my FAL list for Q1. This is my fifth finish – yay! This post contains affiliate links. Items bought through these links don’t cost you any more, but earn me a small commission. WOWZA! What a fantastic finish! I’m well impressed with your bag making skills. We could use a water proof bag or two here in Ireland 🙂 Thank you for participating in the FAL, on behalf of the 2016 global FAL hosts.